What teenage girl doesn’t put on a façade for the world? Try to convince everyone, including herself, that her life is perfect? Well, that’s the case in the emotionally-charged new YA novel by GCC member Mindi Scott. 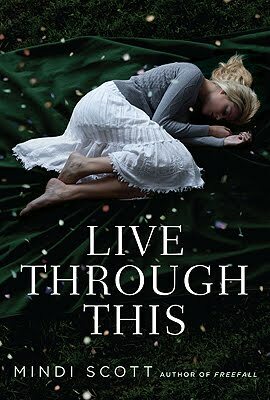 Learn how far the girl-next-door will go to protect the truth about her life in Live Through This, an amazing book out this month through Simon Pulse. From the outside, Coley Sterling’s life seems pretty normal . . . whatever that means. It’s not perfect—her best friend is seriously mad at her and her dance team captains keep giving her a hard time—but Coley’s adorable, sweet crush Reece helps distract her. Plus, she has a great family to fall back on—with a mom and stepdad who would stop at nothing to keep her siblings and her happy. But Coley has a lot of secrets. She won’t admit—not even to herself—that her almost-perfect life is her own carefully-crafted façade. That for years she’s been burying the shame and guilt over a relationship that crossed the line. Now that Coley has the chance at her first real boyfriend, a decade’s worth of lies are on the verge of unraveling. In this unforgettable powerhouse of a novel, Mindi Scott offers an absorbing, layered glimpse into the life of an everygirl living a nightmare that no one would suspect. Q: In ADIOS TO ALL THE DRAMA, Mariana is a bridesmaid in her cousin’s wedding. How many times have you been a bridesmaid and what’s the worst dress you ever wore? Mindi: Let’s see. I think I’ve only been a bridesmaid once. (I’ve also been a bride, maid of honor, candle lighter, and flower girl.) The worst dress was for a wedding that ended up being called off actually It was this peachy-pink color that looked awful with my skin tone. Q: I’ve used some of my personal background in each of my novels. Did you take any snippets from your real life when writing your latest book? Base any characters on real people? Mindi: I take SO MANY snippets from my real life or from things that people tell me about their lives. My sister read my newest book and started rattling off all these small details that she recognized. I don’t really base characters off real people, but there is an occasional character who I can say is loosely inspired by someone real. Q: Let’s talk publishing. What was harder for you, finding an agent or an editor? Why? Mindi: An agent! It took me two years and a total of around 150 rejections on two manuscripts to sign with my agent. But my editor (who was my former instructor in an online writing class), acquired my first novel in my agent’s first round of submissions. Q: Where did the idea for you latest novel come from? Mindi: I’ve actually written a letter for readers and posted it on my website explaining this in detail. The basic gist, though, is that I put off writing this book for years because I thought someone with more distance from the subject could do it better. One day, I realized that that wasn’t the case and that I needed to write this book. Q: Where were you when you found out that your latest novel was going to be published? Tell us the story. Mindi: I remember that I was upstairs in my home office when my agent called with the offer. I honestly don’t remember much about it, except that I quickly promised that I could meet a crazy (for me) deadline because I was so excited to have received an offer for my second book. Thank you, Mindi! Now, everyone go out and buy books, lots and lots of books!